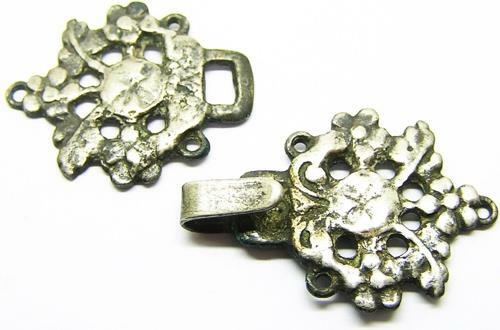 This is a rare and intact clothing fastener set, dating to the 16th - 17th century A.D. Each piece would have been sewn onto a richly embroidered fabric, used to fasten together through the hook. This would have been on a cloak or similar piece of Tudor period clothing. This is an excellent example in very good condition, being originally stored away in an oak chest.